NFD NOT A WALK IN THE PARK! WINNING the National First Division (NFD) requires a lot of hard work and determination from players. It is not an overnight occurrence, accomplished without proper preparation. Some teams have been in the NFD for a long time and are still struggling to even come close to gaining promotion to the Absa Premiership. Clubs who were in the PSL and got axed often struggle to make a comeback. Some even get relegated a second time, to the unfashioned ABC Motsepe league. This was the case with Moroka Swallows, relegated in 2014-15 season, and Santos, relegated at the end of last season. Black Leopards, Jomo Cosmos, University of Pretoria and Stellenbosch FC have all plied their trade in the Premiership, only to be relegated. They have now spent more than two seasons in the NFD without making a comeback. 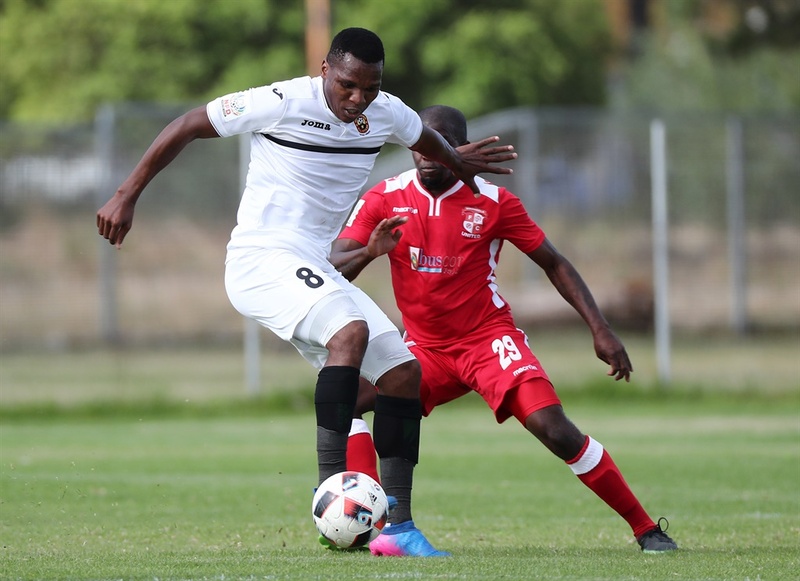 Leopards and Stellenbosch made it to the promotion/ relegation play-offs last season but were unable to capitalise and return to the top flight. Cosmos’ new acquisition, striker Clifford Mulenga, believes that individual brilliance doesn’t play the key role in success, it is teamwork that will win them the league. The Zambian player scored 12 goals when he was still playing for Mbombela United last season. “The first thing we need to do is take all the clubs seriously. “There’s no small team in the NFD, all the teams have one goal – to play in the PSL,” said Mulenga. “If you talk about Cosmos everyone thinks about the PSL and this is the season we’re coming back. It doesn’t matter how, we will make it. Ezenkosi have played three games so far winning one when they beat AmaTuks 5-0 and losing two, to Highlands Park and Tshakhuma Tsha Madzivhandila FC respectively, with the same 1-0 scoreline. Mulenga has scored only one goal this season but says he is not concerned about that. Ezenkosi host Richards Bay FC next at Vosloorus Stadium on Sunday (3pm).